The Knaphill, Brookwood and Chobham Branch covers the areas of Knaphill, St Johns, Pirbright, Brookwood, Bisley, West End and Chobham. Welcome to the Knaphill, Brookwood & Chobham branch of the NCT, covering Knaphill and its surrounding villages. We are a branch that is run by parents, for parents - and we are all volunteers. We aim to meet new parents and parents-to-be, helping them through the transition to parenthood, as well as offering plenty of opportunities to socialise in a child-friendly and informal way. For seller-related queries, please contact NNS.knaphillbrookwoodandchobham@nct.org.uk. You are welcome to bring your baby with you to the course. For more information, visit our first aid branch page or email firstaid.knaphillbrookwoodandchobham@nct.org.uk. The Knaphill, Brookwood & Chobham Committee meet every 6 - 8 weeks for meetings to go through our current events, as well as eating too many nibbles and comparing stories of what our little ones are up to! We are always looking for people to join our small but very friendly team. We also meet for social outings, and our children meet to play. We welcome anyone that may wish to join us for all or any of this. For more information, please contact coordinator.knaphillbrookwoodandchobham@nct.org.uk. Would some friendly advice and support in the early months of your new baby arriving be of help? If so, we can put you in touch with experienced Mums in your local area who can offer some advice where needed, give information on amenities and places to go for you and your new baby in the surrounding area or simply offer a sympathetic ear and cup of coffee! Please contact Buddy.knaphill@nct.org.uk. Giving birth is an exciting time, and many people attend antenatal classes to help prepare you for the big day. However, when the euphoria wears off, and the visitors stop coming, you can often feel like you need a little more support with day to day life with your baby – and that’s where Early Days courses come in. They are very informal, and you get to discuss issues that are important to you with other mums from your local area who have young babies. You may talk about feeding, crying, sleeping, your relationships, your postnatal body, routines – generally what you thought it would be like and how it has turned out to be! The same mums (and babies) attend each week for 5 weeks, and usually go on to form a supportive group of friends who continue to meet up after the course has finished. For further information, please click on the Early Days link on the right hand side. 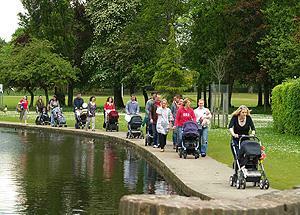 We do not currently have anyone to run our buggy walks. If you are interested in taking on this role, please contact: coordinator.knaphillbrookwoodandchobham@nct.org.uk.